At Westish College, a small school on the shore of Lake Michigan, baseball star Henry Skrimshander seems destined for big league stardom. But when a routine throw goes disastrously off course, the fates of five people are upended. Now that I have finished the book I have been reading some reviews and am surprised it has not been more highly regarded. Are they reading a different book? I can understand why it has done better in the States, with the American college setting, but it seems a lot of UK readers found the writing tedious and the baseball theme boring. I know nothing about baseball. During one summer, when I was working in America, I went to a Portland Sea Dogs baseball game. I had no idea about the rules of the game, still don't, but I just wanted to be part of the atmosphere. 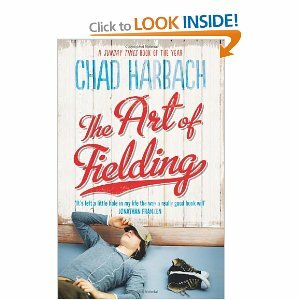 This book is not a 'sports' novel, not a book just about baseball, it is about people. I quickly was attached to the characters and when I wasn't reading found my thoughts turning back to their lives. I was engrossed. I loved reading about the passion of the sport, but more about the relationships of the main characters.There was not one character that I did not enjoy reading. The relationships between Owen and Guert, Henry and Mike, Pella and Guert and the emotional friendship between Pella and Henry. I am sure the characters in this book will stay with me for a long time. In short, I would highly recommend it. Sounds like a great read! Thanks for linking up! Kuwait. Wait, I recognise you!